This is the fourth letter in the series. In the last letter Janis' sister and mother seemed a little upset with Janis' decision to marry while away from home - and while his girlfriend was waiting for him to return from war. This letter is quite brief, no new revelations, however the second half contains some information about life on the farm during the early years of the occupation. When I read these letters, I sometimes wonder how much of them to publish on the internet. I'm not certain how Janis would feel about these private letters being made public. The last letter in particular seemed quite personal. This letter might not contain a lot of interesting information. Up until now I have decided to publish everything. It is hard to know how important some of the minor details could be in piecing together some of the 'bigger picture'. There were probably thousands of Latvians in a similar position to Janis, and maybe tens or hundreds of thousands who were farmers during the occupation. In the end, it is the details that made my family -and Latvia - unique. To that end, I believe that the positives outweigh any negatives and it is important to publish as much as possible. Greetings, our dear, dear Janis! Dear Janis, we have not written to you for a long time – we sent the last greeting cards for your birthday and your second namesday. The last thing we have received from you was the Janu day greeting. Thank you sincerely for all your letters and greetings. We have received nothing from you now for over a month again. We wait every day – perhaps you have moved to a different place? Still, I am writing now, perhaps something written to your old address will reach you. We think that you wouldn’t be angry about the letter we wrote to you after we got the news that you were married. We didn’t really write anything so terrible. Naturally we were then concerned about your happiness. But you know best yourself and so we needn’t worry about that, and now as always we wish you God’s mercy and blessing in your life together. For now you do not feel so alone away from your homeland. We are now working hard with the harvesting. 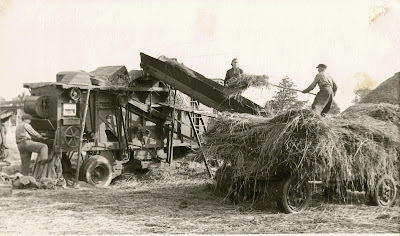 Today father and I will bring in the last oats, we’ll pile them up outside. We piled the rest of the grain in the hay shed and the loft of the cattle shed. The hay – in the cattle shed and the granary loft. Threshing is starting too. Yesterday we were at the Melneris’. On Monday we will go to the Kaupelis’. It looks like our turn will come towards the end of the week. Threshing time is a nice time, isn’t it? You remember the many threshing parties that you took part in in your homeland. Then Latvian songs resound, the singing Lavian soul resounds.- We have conserved some berries already as well. Apples too this year. So we live, work, in our thoughts we are often with you, in sorrowful anticipation - when will you be able to be in your homeland again? – We wish all the very best from our hearts to you and your wife Lidija and son Ilmars and may you soon return to your homeland! With very, very best wishes to you all! Mum, dad, grandma and I,- Kate. As per usual, if you happen to know anyone mentioned in these letters please contact me via twitter @cirksis or google+ by clicking on the link in the "about me" section of this blog. I have had a couple of people who wanted to talk to me on Facebook - I don't have an account. If you don't have twitter or google+ leave a comment below and perhaps we can find another method of communication (perhaps email). Also, if you are interested in having any Latvian documents translated I may be able to pass on your details to the person who has translated these letters for me. Thank you for sharing your translations. They are really tender and we can learn so much about the angst of the family back in the homeland.